Look, it’s not like The Hobbit is Holy Scripture. It’s not even, last I checked, part of the Apocrypha. It seems to me that the standard for judging Peter Jackson’s film rendition, then, ought to be whether it succeeds as art, rather than its faithfulness to Tolkien’s book. If we view the film as an action flick, in other words, it’s not half bad. Yes, Jackson’s desire to S-T-R-E-T-C-H the story across three segments, thereby extracting triple the ticket revenue, leads to irritating delays. I’ve fed my four children, given them dessert, cleaned the kitchen, bathed the little ones, shouted and cajoled them all into bed, and had my evening Scotch faster than the dwarves take to finish their meal at Bilbo’s. But this is annoying precisely because there’s no action. Once the swords start swinging, the movie is more fun, and far more profound, than most action fare these days. But there’s no white orc in The Hobbit! The trolls are all wrong! That’s not the Goblin King’s rightful personality! Not so with Tolkien, however. I don’t know if it’s because he’s been adopted as patron saint of the latest, seemingly interminable war against anti-Semitic fascism, or inducted into the unofficial Christian canon, but folks seem inclined to view his work as unalterable. If Martin Luther had been held to the same standard, the Protestants would be reading a different Bible right now. In short, if you want your children to imbibe the aesthetic feel of Tolkien and embrace his theology of mystery and grace, then read Tolkien to them, for crying out loud. If you want to watch a bunch of orcs get their heads handed to them, on the other hand, then go see the movie. There’s no need to constrain one with the other. Well said! They’ve been telling us for years that they were going to mine the depths of notes and appendices to get to their preferred running time. My problem with the movie is mainly due to pacing and not to any deviation from the original. Personally, a hobbit joining dwarves to steal gold from a dragon doesn’t warrant 9 hours in front of a screen. But, that’s me. Pingback: Moe Lane » A defense of the Hobbit movie being, well, a movie. Nine hours of hobbit-dwarf adventuring is a bit much. 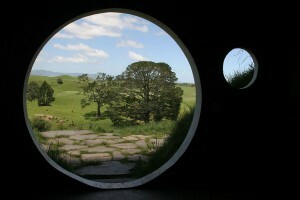 Peter Jackson had two extra constraints on him: squeeze three films out of a one film story, include characters from LoTR to tie in the series. He had to incorporate new “bad guys”, as most of the book is just a on-the-road journey with different challenges. I did read “The Hobbit” before seeing the film, and like others it was a little bothersome to view the divergence on the screen but not unexpected. I did not read LoTR before seeing the movies, and now I don’t know if I ever will. Re-watching the LoTR movies is melancholy for me as I think about “poor Mr. Frodo” and how it ends for him. My 8 y.o. daughter kept asking if we’d see Frodo in “The Hobbit” and we kept telling her no, that it was before his time. Wouldn’t you know it, his big mug ends up on the screen and makes a liar out of me. Oh well.